It’s one of the first things you learn in French class. Men are just men – Monsieur – and women are only women as defined by their marital status – Madame (if married) or Mademoiselle (if not). Only now, things are changing. The French, officially at least, are dropping Mademoiselle as a form of address for women. The Prime Minister’s office issued a document last week, phasing out the use of Mademoiselle on official forms. 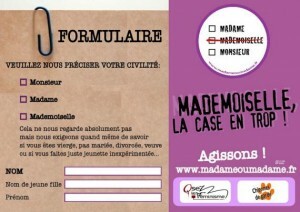 Old forms will be used until they run out, but thereafter the options will be limited to Madame or Monsieur. The document also instructs ministries and administrative bodies to discontinue requests, where possible, for maiden name and spouse’s surname on forms. The edict comes after two French towns, Cesson-Sevigne in Brittany, and Fontenay-sous-Bois near Paris, banned the official use of Mademoiselle. French feminist groups have been campaigning for years for Mademoiselle to be dropped, saying its use is sexist and discriminatory, which clearly it is. French women have never had the option of the neutral ‘Ms’ so women were ‘Madame’ or not, whether they liked it or not. Another French feminist group who welcomed the change was Les Chiennes de Garde, whose campaign to get rid of the distinction in female honorifics, ‘Mademoiselle, La Case en Trop!‘ was launched in September last year. However, the change has not been welcomed by all. It hasn’t even been welcomed by all French feminist groups. Paroles de Femmes, a women’s group which fights for women’s equality, isn’t very impressed with the victory, with its President, Olivia Cattan, saying the word mademoiselle had never annoyed her. The organisation also pointed out that women have bigger problems. A poll it conducted in 2011 called ‘What Women Want‘, seems to back them up: it found that the use of mademoiselle was listed bottom of the main concerns of French women today – just 10% against 84% calling for equal pay. There is also a very vocal group of women to contend with who positively enjoy the use of the word mademoiselle when applied to them because Madame sounds ‘old and expired’. In other words, being called mademoiselle, despite having reached a certain age, makes them feel young. And tackling the entire Western culture’s insistence that women revel in being young, as opposed to, say, distinguished or powerful or experienced, will take more than the banning of mademoiselle, that’s for sure. It may even require a keen look at the fact that the French word for ‘woman’ is exactly the same as that for ‘wife’, regardless of whether she’s a Madame or not.